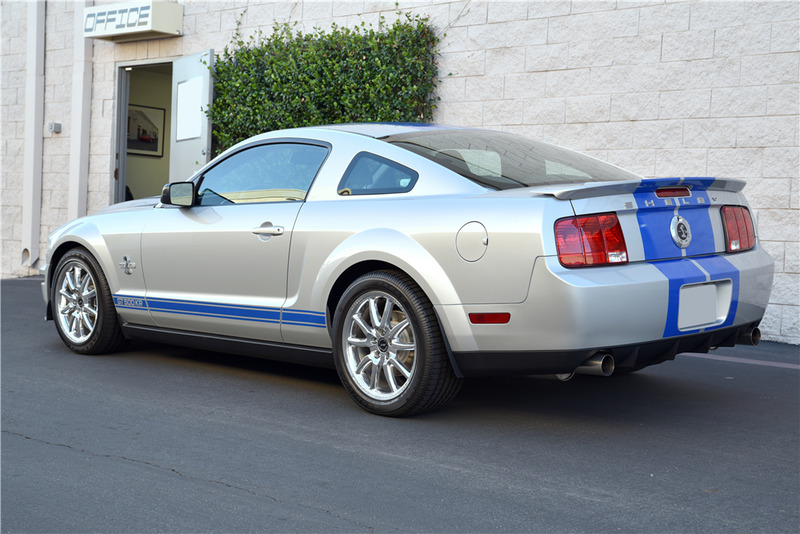 This GT500 KR (King of the Road) 40th Anniversary coupe is one of 1,000 built, and one of two with consecutive VINs and consecutive Carroll Shelby CSM numbers. CSM 08KR0033 is being sold back-to-back with the next vehicle in the sequence, CSM 08KR0034. It’s finished in silver with blue stripes and has been stored in a cool and dry climate since new. It is a one-owner car with 399 actual miles. It’s powered by a 5.4-liter V8 engine producing 540hp and 510 ft/lbs of torque with a Ford racing supercharger and 6-speed manual transmission. This KR comes equipped with Brembo 4-piston front and rear brakes, Shelby Performance exhaust and Ford Racing tuned SVT suspension. It rides on Shelby Alcoa Super Snake forged 20” wheels. CARFAX shows Ford Motor Company manufacturer safety recall on 06/30/2016: Passenger airbag inflator replacement.